International Journal of Research in Health Sciences,2017,5,2,36-39. 1Junior Resident, Department of Oral Medicine, Diagnosis & Radiology, Pacific Dental College and Hospital, Udaipur, Rajasthan, INDIA. 2Reader, Department of Oral Medicine, Diagnosis & Radiology, 4Undergraduate, Institute of Dental Education & Advance Studies, Gwalior, Madhya Pradesh 3Senior Lecturer, Department of Oral Medicine, Diagnosis & Radiology, Narsinhbhai Patel Dental College & Hospital, INDIA. Residual cysts are inflammatory odontogenic cysts that are usually asymptomatic and present on a post-extraction site. 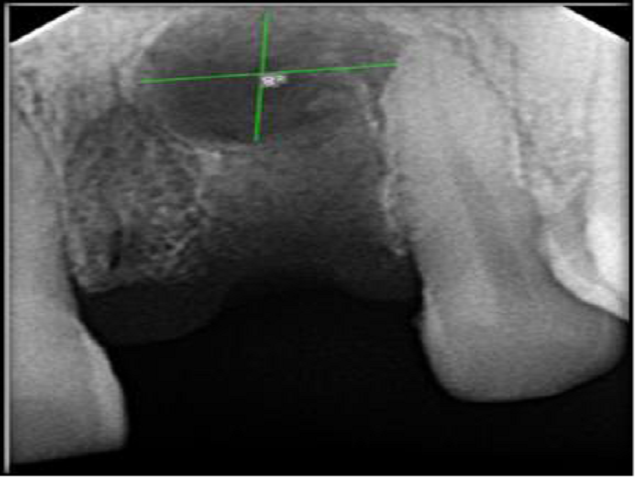 Mostly incidentally detected on imaging, or expansion of affected region, or pain and drainage, these cysts may arise from inflammatory fibrous and granulation tissue at the apex/ periapical region of a tooth not curetted at the time of dental extraction. A 50-year-old Iranian man complaining of absence of tooth in the upper front jaw region. Radiograph revealed the presence of a well-defined well-corticated radiolucent lesion in the area underlying the edentulous ridge, suggestive of a residual cyst. Presentation, diagnosis and management of the lesion followed by prosthetic rehabilitation are discussed. Preoperative IOPAR reveals a well defined, well-corticated cystic lesion.